Whether it's your first hire or your thousandth, employers should have very clear and thorough knowledge of background checks. Pre-employment background checks are highly recommended to reduce turnover, minimize risk of negligent hiring and legal costs. At a minimum, employers should be verifying previous employment, education, criminal records, and credentials. The Equal Employment Opportunity Commission (EEOC) has recommendations for screening candidates that employers must also follow so they won't be responsible for punitive damages if the candidate decides to file a claim. Employers should also know what screens to ask for, how to get a faster turnaround and at a fair cost. Several government agencies are set up to regulate the treatment of employees and candidates. For instance, when running background checks, employers are to follow the guidelines of the EEOC and FTC for screening job applicants. In general, employers must comply with the Fair Credit Reporting Act (FCRA) to determine that personal information is protected and the EEOC so that no persons are discriminated against due to gender, race, color, sexual orientation, religion or disability. Obtaining consent and authorization for a background check with a clear document, separate from an application. Assessing each record that is returned to against a decision matrix to determine if there is any reason the candidate cannot take the job. 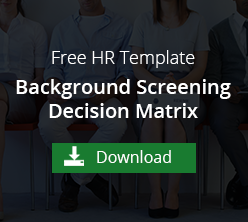 This decision matrix works to prevent discrimination and bias in hiring. Taking pre-adverse action by letting the candidate know that negative information was found that could be used in a no-hire decision. This pauses the screening process so the candidate can dispute untrue data. Following adverse action procedures if there were no disputes so the candidate has access to the information used against them and clarity as to why they weren't hired. Instead of running every background check on applicants, employers should make sure the screens are specific to the job. For instance, if the job doesn't include driving or operating a motor vehicle, then an MVR driving record may not be necessary. A basic background check can verify the person's identity, education, employment experience and criminal record. If they work with finances or money, they may also need a credit check. If screening decisions are made depending on the position or job, it will save time and money in the long run. Another way to save time and money is to be aware of why turnaround may be slow or what causes expensive background checks. First of all, employers don't need to run background checks on every job candidate. That can be extremely time consuming and expensive. Narrow the candidate pool first. It may even be wise to offer the job contingent on the background check results. As mentioned, there's no need to run every single background check on every single candidate. Only run the screens that are applicable to the job you're hiring. Another cause of slow turnaround would be inaccurate data on the application. Many employers are moving to online applicant portals so there is less risk of illegible handwriting or data entry errors. With fewer candidates, more discerning background checks, and applicant entry of their own information, turnaround time and cost can be greatly reduced. One of the most important parts of the screening process is understanding the terms and jargon. The more employers understand, the easier the process, the faster the turnaround and the better the value. A professional background check partner will help guide employers through the background check process, explaining what to expect, how to read the screening results and reducing the risk of non-compliance. Ask if your background check provider is trained on FCRA compliance and is affiliated with the National Association of Professional Background Screeners. They should be transparent about their background check process, how long it may take and what the cost will be. If you have any questions, want to learn more or see a demonstration, click the green button below. VeriFirst would love to be your valued background check partner. For additional information on employment background checks, visit our guide to Best Hiring Practices.